I am taking a dip into Asian dramas, and I'm starting with one I watched some months ago. 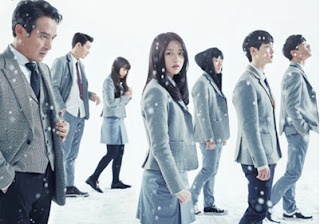 Solomon's Perjury is a South Korean mystery drama. It first aired in South Korea in December of 2016, and is available on Netflix. The show follows a small group of students as they investigate every detail and analyze every move that led to the death of their classmate, Lee So-Woo, whose body is discovered on school grounds. After investigating, the police conclude that his death is a suicide. However, students are unconvinced. #Spoilers. As a mental health professional, this is an issue that I care very much about. I feel that there is a global need for bringing awareness to mental health issues, especially suicide, in a sensitive and responsible way. I wanted to see how this series treats this issue, and how others around So-Woo cope with the event. The series makes the viewer question from the beginning whether So-Woo has really taken his own life. So-Woo had no known friends, and he was not in good standing at school. In fact, he had just recently been a victim in a bullying incident which many of his peers witnessed, but did nothing to stop. Having no friends, not being accepted, and being bullied can contribute to the development of mental health difficulties and a decrease in overall well-being. We also see later in the series that So-Woo was having conflict with some individuals in the school administration due to having uncovered corruption. 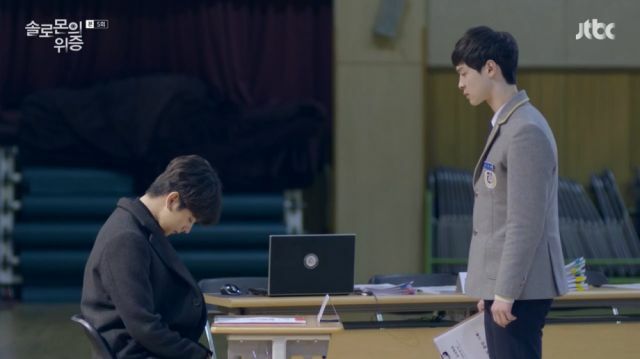 After an anonymous letter is received, students quickly turn to accusing one of their own peers of murdering So-Woo. Although it presents itself as a mystery series, Solomon's Perjury can be seen as a story of how different individuals cope with suicide, and how difficult it can be to come to terms with such an event. The show reminds me a bit of the Netflix drama 13 Reasons Why. However, where 13 Reasons Why focuses on the protagonist's own account of what led to her decision, literally outlining the reasons she felt she had no hope and no way out, Solomon's Perjury leaves it all up to the survivors to figure out. There is no explanation, only the interpretations of known events as perceived by others. This is what felt most painful, and most true. People who take their own lives don't always leave suicide notes, and even when they do, most of the time the surviving loved ones are left with too many questions, trying to put together a puzzle that is missing too many pieces. We simply do not always get the answers. The event depicted in this show is of immense significance. Suicide is the fourth leading cause of death in South Korea, and is the leading cause of death among South Korean individuals between the ages of 15 and 24. It is definitely an issue that demands attention. I felt absolutely heartbroken when researching this, and I wonder if the creators of the show took these facts into consideration, or if it is a common theme represented in South Korean television. South Korea has the highest rate of suicide among children and adolescents ages 10 to 19 in the world. In case you're wondering, suicide is the 10th leading cause of death in the U.S. When someone we know takes their own life, we are often left wondering why. We might blame others, or experience denial, anger, or guilt. People cope with grief in different ways, and how we cope is affected by our relationship with the person who has passed. Most of So-Woo's peers were not very close to him, but they are still very much affected by his death. They readily believe the anonymous account that someone witnessed the murder over the official police conclusion. There may be multiple factors that contribute to this. First of all, the students all witnessed So-Woo being victimized. Secondly, being adolescents, they may have a general distrust of authority figures if they feel as though they are not being given all the answers, or if they are being treated like children. Third, they may have trouble understanding suicide in general, especially if they had feelings of guilt about doing nothing to defend So-Woo when he needed them. This leads them to make the decision to hold a mock trial to discover what "really" happened, against the school's wishes. The mock trial is presented as a way for students to process So-Woo's death, and to heal. But the path to healing is not smooth. The student leading the "prosecution" is Go Seo-Yeon, class president and top of her class. As the one who received the anonymous letter, she initiates the mock trial with a little encouragement from another anonymous peer. Seo-Yeon seems like a good person, however, she is holding on to feelings of guilt over not standing up for So-Woo when she had the chance. Not only was she one of the students who witnessed the incident, but she was one of the few students who could say she had friendly interactions with So-Woo. It was Seo-Yeon who So-Woo was most disappointed in after she failed to come forward to school administrators when asked directly. 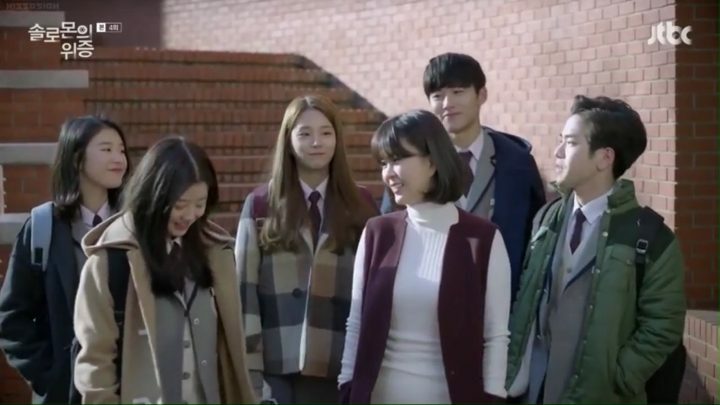 As class president, Seo-Yeon is held to a higher standard by school administration as well as her parents, but she failed her friend. It is apparent that she feels she must push for the mock trial, if only to appease her own sense of guilt or remorse for her previous lack of action. It is not abnormal for someone to channel their grief into something they care about. For Seo-yeon, the mock trial is a way not only to heal herself or the school as a whole, but to bring what she thinks will be justice to So-Woo and to give him a voice. She believes that, since she and others failed to speak up for him, it is now their responsibility to discover the "truth." As a naturally proactive person and an overachiever, it is not out of the ordinary that she would go to such lengths as to risk her own academic standing to go against the school's wishes. It is also not abnormal for a person to find something to focus on, or something to give them purpose, after a significant loss. Many individuals find themselves motivated to do something meaningful. Whether this be advocating for something they believe in, becoming active in their religious institution, raising funds for a cause, or working toward increasing awareness of mental health issues and suicide, this gives them purpose and provides the sense that something positive might come from their loss. 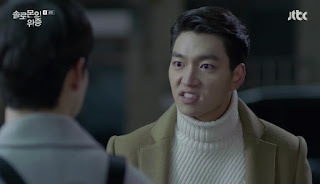 The students representing the "prosecution" in the mock trial accuse the school bully, Choi Woo-Hyuk, of murdering So-Woo. They use the fight they witnessed and previous bullying incidents as evidence of his aggression, and they use the anonymous letter someone wrote claiming to have witnessed this. At some point in the mock trial, there is credible, indisputable proof that the letter is fake, however, Woo-Hyuk's peers continue to go after him. As mentioned above, perhaps their own feelings of guilt over having witnessed the bullying incident but having done nothing to stop it propels them to continue with their accusations. There is also the fact that, when asked by school administrators, they all refused to speak up in defense of the victim when asked to do so. How often do we wish that we had done something, and how often are we in the position to actually stop something bad from happening, or to help someone when they need help? The truth is that not one of us knows exactly what we might do in a difficult situation, until we are in that difficult situation. But not doing anything would make most people feel guilty, especially if there are severe consequences, as in So-Woo's case. Woo-Hyuk's reputation as a school bully is rightfully earned. He shows very little empathy and terrorizes most of his peers. He beats up people in fits of rage and then forgets about them. He laughs when he hurts others. After So-Woo's death, he jokes about having murdered him. He shows little emotion overall about the fact that one of his peers has died. We find out later that Woo-Hyuk's aggression and apparent lack of empathy are his coping mechanisms. His father is extremely abusive of him and his mother. Regardless of how he feels about a peer's suicide, Woo-Hyuk lives and breathes abuse every day of his life. It is not abnormal that he would not express grief or feelings of guilt, if he had any. For the sake of his own survival, he cannot lower his defenses, because he is constantly in a state of fight-flight-or-freeze. In addition to this, during the trial, his grandmother dies in a house fire, which makes him more angry and detached from the mock trial, making him look more guilty to some of his peers. During the mock trial, So-Woo's brother is presented as a witness for the "prosecution." He does not believe his brother has taken his life, and argues in a heartfelt testimony that his brother was too selfish, that he loved himself too much, and was too emotionally callous to have ever harmed himself in this way. He shares that his brother liked to press buttons, and that he believes he might have pressed Woo-Hyuk's buttons to the point that Woo-Hyuk may have reacted very aggressively. It is understandable why it would be difficult for a loved one to come to terms with the fact that their loved one has taken their own life, especially when presented with another possibility. So-Woo and his brother obviously had a tense relationship, which prevented them from being close, and prevented So-Woo from being open with his brother and perhaps reaching out when he needed help. It is not uncommon or abnormal to experience feelings of anger or disbelief, like So-Woo's brother did, after a loved one takes their own life. It is something that many people would have difficulty coming to terms with. In addition, So-Woo's brother may have created certain defenses to protect himself, expressing himself negatively about his brother, even though he is clearly hurting, and finding reasons why his brother simply could not have taken his life. Perhaps if he remembers his brother as a selfish, disagreeable person, he doesn't have to face the fact that his brother was depressed (even though So-Woo was previously hospitalized). The truth is that many of us might miss those "signs." It is not always the case that we know those closest to us best. It is because they are closest to us that they can hide certain things from us. Maybe So-Woo's brother didn't see the dots clearly enough to connect them, because So-Woo did a good job at hiding them, keeping his brother at bay with a mask of "selfishness." One of the most compelling characters in the series is Han Ji-Hoon. Ji-Hoon initially presents himself as a third party who has nothing to do with the events, and he represents the "defense." He is the "perfect" student, "perfect" son, and makes his adoptive father proud. We discover that Ji-Hoon was actually very close to So-Woo, and they met when they were both in what appears to be an inpatient program for youth at a psychiatric hospital. Their shared history means that he is the closest person to So-Woo. 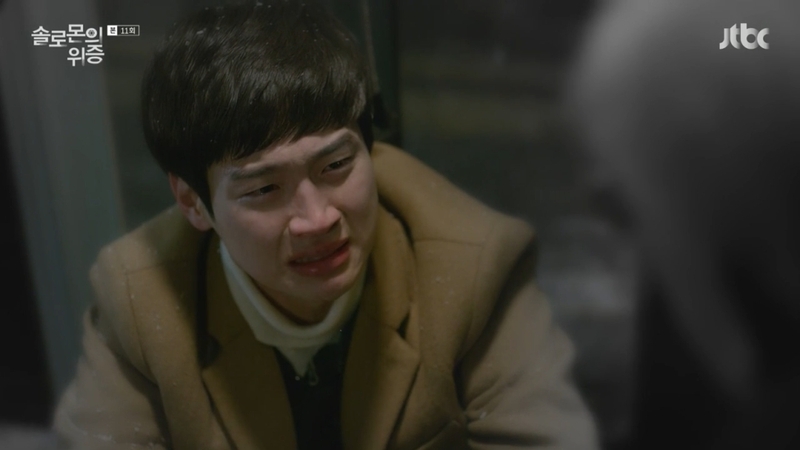 On the night of his suicide, So-Woo called Ji-Hoon, and made Ji-Hoon unwillingly face his own severely traumatic past. 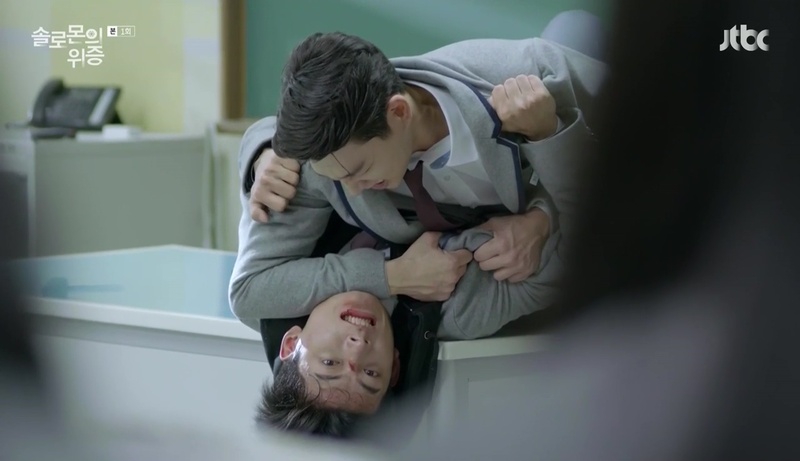 In his state of increasing emotional distress, Ji-Hoon abandons So-Woo, and his words of anger trigger So-Woo to take his own life. Ji-Hoon blames himself for his best friend's suicide. I believe that many people who have seen the entire series may think he is right to blame himself, due to his hurtful words spoken out of anger and perhaps fear. 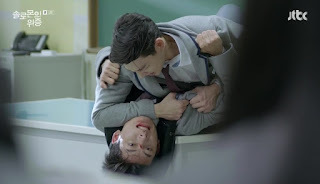 I wonder how many people think that Ji-Hoon represents those people who may not know what to do and freeze, or who may be hurting so much that they lash out. Like many of us might do at any given point in our lives, Ji-Hoon froze when he had the opportunity to act. When someone is not feeling safe and having suicidal thoughts, they might reach out to someone they trust, someone they know cares for them. But when that person is also in a bad place at the time, they might not be able to give of themselves, emotionally speaking. They may not say the things we need to hear at that moment. Despite the fact that they were wrong in not trusting the original police conclusion, there is something to be said about that that speaks to even current events in the U.S. This is, at its core, a story about a group of teens who decide to stand up for something they believe in, with no resources other than some of their parents' support, their research skills, and with an entire institution against them. It is important to mention that these teens' distrust of the adults' around them is not invalid. As it happens, the school administrators were indeed a corrupt bunch, and these are the adults that surround these students all day every day. No wonder they had a clear distrust of adults. The end result of the mock trial was the truth coming out, allowing the class as a whole some closure. The students got to know different parts of So-Woo, for example, how much he cared for the school and his peers. It is interesting to see the few details of So-Woo's backstory flourish in light of his death. It seemed that nobody really knew him... but how many of us can say that we truly know another? Solomon's Perjury began as a mystery and turned out to be, in my opinion, an exploration of how young people might deal with the suicide of a peer, or how they might conceptualize it, or pull together to advocate for what's right. Death often makes us think about life and our values. What are we willing to give up in order to do what's right? Seo-Yeon gave up her good standing at the school, while Ji-Hoon decided to stop hiding the fact that he was not okay. This is probably the hardest thing to do for many people. It is important to remember that we all say and do things that we might later regret. It is also important to remember that it's not okay to make somebody face a trauma when they are not ready. The overall message I think would be good to take from this drama is that none of us is perfect. Sometimes we make huge mistakes, and we can't restart. We say things out of hurt, anger, sadness, sometimes all of the above. We're not always there for those who need us. We don't always have a kind word to say to someone. We're not always in shape to take care of others. And that's okay. We are only human, after all.